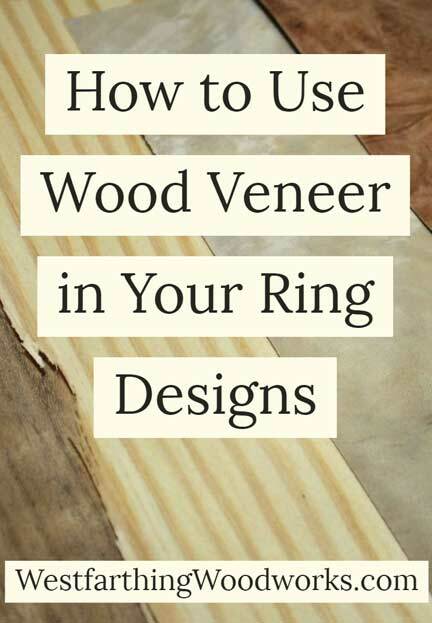 This is how to use wood veneer in your ring designs. Wood veneer is a thin sheet of wood that is very flexible, and comes in nearly every species. Here are several ways you can use veneer on your next wooden ring build to make your designs look even better. 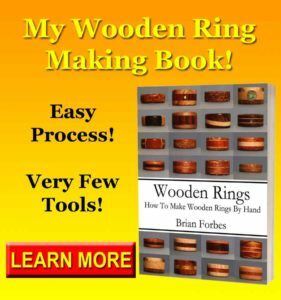 If you are unfamiliar with the wood lamination technique, I wrote a post called How to Make a Laminated Wood Ring that will walk you through the process. Long story short, you glue several thin pieces of wood together to form a thicker blank. Once the blank is made, you then drill for the finger opening, and cut out individual pieces for ring blanks. Shape them, and you have a ring in the end. Lots of times, veneer is used as an accent color in a stack of thin pieces for a blank. Most of the time, it’s just another layer, and that can be a good look. When you use the veneer, pay attention to your placement so you can actually see it in the final look. For example, if you use a layer of mahogany veneer next to another mahogany, or a cherry, you will likely not see the layer at all. This is not the best use of the veneer, unless you want to thicken up one of the layers without milling another piece. Instead, look for ways to put the wood veneer into the stack next to a contrasting piece of wood, so it stands out. It does not have to be the star, but by placing it next to a contrasting species, it at least has a chance to be seen. See Also: 35 Important Tips on Making a Ring for even more ways to make better rings. Another good use for wood veneer in you wooden ring designs is to use it on both sides of another species to add weight to the other species. Wrapping the piece in veneer on the top and the bottom has an effect of framing in the wood, and it can add emphasis. Use a contrasting piece of veneer on the top and the bottom of the wood that you want to highlight. Make the veneer the same species. When the stack is pressed and glued, you will see that the veneer frames in the other species of wood, and creates a highlight that draws you to look at that particular section of the ring. Use this technique on one or two sections of the ring at a time though. If you highlight more than one thing, or you highlight everything, you run the risk of the technique backfiring, and it being so much that it highlights nothing instead. See Also: Grain Direction for Ring Making which helps you make your rings stronger, and the designs look more interesting. Another trick to highlighting is to create a three piece veneer stack that is made with a couple contrasting species of wood. One of the easiest is Walnut and Maple. Make a three piece stack with Maple/Walnut/Maple or Walnut/Maple/Walnut and look at it from the edge. It has a nice look, and you can use that strip to highlight as well. Just like in the last example, arrange these veneers so they are above and below the piece that you want to highlight. This is a thicker strip, so it will stand out, and it will frame in the main piece of wood in the ring very well. This combination also works when you use it in the center of a wooden ring, and face it with the same kind of wood specie on both ends. The three color ring runs through the center, and the layers frame it really well. See Also: 17 Awesome Reasons Why I Made My Own Wedding Ring, to learn about making your own wedding ring. Another great place to use veneer is on the faces of a ring. This is when you need to add color, or you want to face the ring with something different then the rest of the body. Either way, faces of veneer are all in the way you glue up the blank. When you are making your lamination for the ring blank, glue a single pieces of veneer to the top and the bottom of the stack. There are the outermost layers, and will become the faces of the ring. When you clamp, use a set of flat cauls to hold the veneer flat, and the blank will look good. Cauls are just flat pieces of wood or another material that is used to create even pressure along a bigger surface. In the case of gluing veneer, you need to hold down the entire piece because it will curl when wet with glue. If you clamp without a caul, the edges and areas not under the jaws of the clamp will not lay flat, and the blank will look poorly made. See Also: Flattening Ring Faces which will help you sand your rings flat. Making a ring completely from veneer is also a lot of fun. This allows you to layer a lot of different colors together, and create a really interesting look. Depending on how you do it, you can even create a bit of a plywood look. Working with wet veneer is a little tricky, so be ready to work fast and get your stack laminated together before the glue has a chance to dry. Make your stack and use a glue spreader to help get a thin film of glue on all the mating surfaces. Have your clamping cauls ready, and get the stack under pressure as soon as you can. There tends to be more squeeze out with this kind of ring lamination, simply due to the higher number of layers. Clean the excess, and you let the blank dry just like any other. See Also: Woodworking Tip of The Week – Gluing Wood for even more wood gluing tips. Cutting and Using Veneer, Gluing, etc. Since veneer is so thin, one of the best ways to cut it is with a scissors. Be careful about how it bends when you are making your cuts, and cut carefully until you get the feel for it. I cut nearly all my veneer with scissors, because it’s fast and easy. You can also cut veneer with a hobby knife. Set up a flat surface that you don’t mind cutting on, and carefully make your cuts. Watch your hands and fingers, and be careful not to cut yourself. This is one of the big attractions to using scissors. It’s much harder to cut yourself. Veneer is also interesting to use when wet, like when covered with glue. Veneer will curl, roll up, bend, and do all kinds of interesting stuff when you get glue on the surface. Keep that in mind when you are working with your veneer so it’s not a surprise. Your homework is to try using wood veneer in a couple of your ring designs. The first step if you do not have any veneer is to buy some. I wrote a post about how a Wood Identification Kit is one of the best ways to get a lot of veneer for a low price. Once you have your veneer, just add it to some of your blanks. When you build a new blank, have a few pieces of veneer in different colors ready to use. As you play around with color and design, you can place it in the stack and see the look. The best thing is to just start using the material. If you have it in the shop, and you have it near where you do your work, you will naturally play with it. When you do, you might find that you really enjoy using the material. Veneer is a great way to add subtle lines of color to your ring designs. It’s inexpensive, and you can find it in a lot of places. If you are making a lot of laminated rings, wood veneer is one more layer that you can add to your designs and looks. There are many different ways that veneer can dress up a ring, and it all depends on what you want to have in your final look. Try veneer inside the stack, to highlight other parts of the wood lamination. Also, try it on the faces to show off the veneer itself. Finally, if you never buy any wood veneer, you can never expect to learn about it. Go to the store and pick up some veneer sheets to work with. Keep them close to your bench, and you will find ways to add it to your designs.